Officials with the Council on American-Islamic Relations (CAIR) are painting a deceptively rosy picture of the organization's relationship with the FBI. The spin follows the group's decision last week to remove an anti-FBI graphic posted on its San Francisco chapter's website. The graphic depicts a sinister-looking FBI agent walking down a street as doors slam shut. "Build a Wall of Resistance," it reads. "Don't Talk to the FBI." CAIR issued a clarification statement calling it "inconsistent with CAIR's policy of constitutionally-informed cooperation with law enforcement agencies." The group had included the graphic as part of a "Know Your Rights" event it co-sponsored in response to several FBI raids conducted during September 2010. Corey Saylor, CAIR's national legislative director, said on Fox News' O'Reilly Factor, that he is "troubled" by the media's critical reaction. "I can speak of a number of different occasions of CAIR's consistent policy of cooperating with law enforcement," he said. O'Reilly didn't press Saylor very hard. There was no mention of CAIR's 2009 announcement that it had joined a coalition threatening to cut ties with the FBI. Saylor also wasn't asked about his organization's founding executives' ties to a U.S. Hamas support network, which resulted in the FBI suspending formal relations with CAIR. CAIR spokesman Ibrahim Hooper touted CAIR's "consistent policy of positive and constructive engagement with law enforcement officials." He promised that nothing "negative" would come from the lips of CAIR representatives at the event advertised. While he acknowledged it should not have been posted, Hooper "refused to renounce the artwork," instead blaming "a cottage industry of Muslim bashers" for the poster controversy. Even if their cited reasons for removing the poster were genuine, generalizations by Saylor and Hooper about a healthy relationship between CAIR and law enforcement are less than accurate. CAIR has a long track record of criticizing terrorism financing and support cases brought by the US government. Its officials called the conviction of the Holy Land Foundation for funneling money to Hamas "based on fear-mongering," despite the evidence. The HLF trial publicized links between CAIR founders Nihad Awad and Omar Ahmad and the Palestine Committee, an umbrella organization of U.S. Hamas support groups. CAIR was listed itself as a component of the committee in internal documents. The government named CAIR an unindicted co-conspirator in the trial. The presiding judge later said there was "ample evidence" tying CAIR to Hamas. Likewise, the group's Maryland chapter criticized 2004 convictions in the Virginia "paintball jihad" case, in which several men were convicted of charges related to supporting Pakistani terrorist group Lashkar-e-Tayyiba, by alleging "selective enforcement of laws and disparate sentencing treatments when the accused happens to be a Muslim or Arab." Similarly, CAIR Dallas-Fort Worth spokesmen called the 2004 conviction of the Elashi brothers for illegally shipping technology to countries listed as state sponsors of terrorism a "witch-hunt against the Muslim community by way of selective prosecution." At a March 2009 "Know Your Rights" seminar in Anaheim, CAIR-Los Angeles staff attorney Ameena Qazi warned attendees not to submit to voluntary questioning by law enforcement. "Don't," she advised, "offer them your life story and all the information about your immigration history and everything." National Lawyers Guild representative Jim Lafferty told the audience, "No, the FBI is not your friend." He added, "If you stand up to the FBI you will be striking a blow for freedom for us all." Last August, CAIR-California advertised it had provided assistance to a woman approached by FBI agents about her interactions with American born radical cleric and al-Qaida in the Arabian Peninsula (AQAP) leader Anwar al-Awlaki. No mention was made about the importance of providing information on Awlaki, now considered the inspiration behind many recent terrorist attacks in the U.S. It did note that CAIR provides free legal services for those approached by the FBI. During a 2009 khutbah (sermon) given in Anaheim, Calif., CAIR-Los Angeles Executive Director Hussam Ayloush said that just because there are "bad apples in the FBI," Muslims "should not start suspecting each other." Ayloush told the audience to report anyone acting in a "suspicious way," but added that "otherwise, we should not be spreading rumors." Ayloush encouraged the audience to "report any FBI contact or harassment that you receive to the CAIR offices." The Minneapolis Somali community even protested CAIR's "Know Your Rights" efforts in response to FBI investigations into missing Somali-American youths. Family members of a Minnesota boy believed to have been killed in Somalia after being recruited by the terrorist group al-Shabaab handed out flyers at a CAIR protest rally. The flyers countered that CAIR's actions "have led many in the Somali American community to believe that they are intentionally shielding from prosecution members of a network which has been providing material support to a terrorist group," al-Shabaab, which has been involved in the "trafficking of American youths." Last month, CAIR-Michigan Executive Director Dawud Walid said that "the FBI, by using informants acting as agent provocateurs, has recruited more so called extremist Muslims than al-Qaida themselves." As the Investigative Project on Terrorism previously reported, Walid has rewritten stories behind FBI operations to make the FBI look like it created plots. Walid has also cited purported "facts" about the FBI's actions during a 2009 raid in Detroit. In April 2009, Ayloush told mosque attendees in Anaheim that the FBI shouldn't send agents in mosques. "Our Koran is off limits. Our youth, who they [the FBI] try to radicalize are off limits." Speaking about the case of the "Bronx Four," CAIR-Chicago Executive Director Ahmed Rehab claimed that the "radicalization 'tipping factor,' if you will, was none other than a paid government agent-provocateur." Rehab called the use of informants, such as in the Bronx case, "self-deluding initiatives that seem to seek terror-case quotas." The Bronx Four were convicted in October 2010 on seven counts related to a plot to destroy a synagogue and Jewish center and to shoot missiles at military planes. In December 2010, Zahra Billoo, director of the same California chapter that posted the controversial anti-FBI flyer, responded to the FBI's use of informants to foil plots in Oregon and Maryland saying, "What the FBI came and did was enable them to become actual terrorists, and then came and saved the day." The FBI "is creating these huge terror plots where they don't exist." In July 2010, CAIR-Connecticut Executive Director Mongi Dhaouadi told an audience at a New York event that the "FBI keeps coming after the weak" and those who are "afraid" or "intimidated." CAIR-Ohio's Julia Shearson authored an April 2009 article criticizing new FBI guidelines. "Outspoken Muslim leaders and groups continue to be demonized and marginalized," she claimed, by the FBI's, "infiltrations," "abuses," and "provocations." In 2003, Hooper alleged that the Department of Justice has a "general policy of targeting Muslims because they are Muslims." In 2004, When FBI Director Robert Mueller asked the nation to be on the lookout for seven terrorism suspects, Hooper told the Detroit Free Press, "It's part of the 'round up the usual suspects' mentality. When you don't have any other leads, you gather up the Muslims." On the recent O'Reilly Factor, Saylor cited examples to back up his claim that CAIR is a friend of the FBI's. In one of Saylor's cited cases, the case of Ahmadullah Niazi, brother-in-law of Osama bin Laden's security coordinator, CAIR focused on its disapproval of the FBI informant to distract from the merits of the investigation. According to the U.S. government, Niazi lied on his naturalization application and to U.S. officials, including failing to disclose his associations with terrorist organizations, other names he had been known as in the past and a trip abroad to Pakistan. The Muslim community reported the FBI informant to the FBI. Yet the informant wasn't the only source of information in the case. FBI Agent Thomas Ropel III testified that Niazi said it was a duty to perform "jihad" and discussed with Ropel sending the informant to training camps in the Middle East. Also, according to Ropel's testimony, Niazi called Osama bin Laden "an angel." CAIR's Hussam Ayloush said that the informant in the Niazi case was hired by the FBI to "instigate acts of violence to ruin the reputation of the Muslim community." 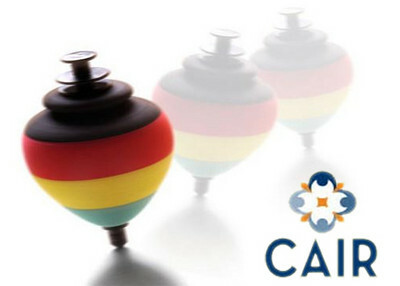 In a second case, in which CAIR connected families of the Zamzam Five, five missing Virginia youth, with the FBI in November 2009, CAIR officials quickly began toning down their description of the facts of the case. At first, Executive Director Nihad Awad described a video tape left by the boys as a "farewell" that made him "uncomfortable." Later, Awad argued that, should they be sent back to the U.S., the government should not prosecute the five young men who disappeared from the suburban Washington, D.C. neighborhood, only to turn up in Pakistan hoping to join the jihad against American troops. The government has to show some appreciation for the actions of the parents and the community," Awad said. "That will encourage other families to come forward." A Pakistani court rendered the issue moot in June 2010, when Ramy Zamzam, Umar Farooq, Ahmed Abdullah, Waqar ul Hassan and Hassan Yasir, were convicted of conspiring to carry out terrorist attacks, and sentenced to 10 years in prison. I can only hope that when Peter King holds his homegrown Jihad hearings, he condemns CAIR and other Islamic organizations like it. King also needs to note the fact that Keith Ellison is well connected to CAIR and to the muslim brotherhood. Its one reason why CAIR and Ellison are trying to downplay these upcoming hearings. Hopefully Peter King will come down hard on CAIR as a supporter of hamas. Thanks for the good work you guys here at IPT in bringing out information that few other sites provide. Certainly the liberal media will never give us the truth about the evils of Islam. They are only too willing to submit to our enemy.